I was standing in front of a street food vendor and staring at noodle and meatball, thinking of having something for dinner. A lady approached me and started talking in a language that I could not understand. I believed it was Vietnamese. I looked at her and smiled and shook my head to signal her that I did not get it. Having realized that she was facing a foreigner, she called a man whom I believed to be her husband. She asked for help to communicate with me but apparently she called a wrong guy. The man spoke no English. What could I do? I was thinking for a while and started to use my natural instinct. I demonstrated a sign language by pointing at the noodle and made a sign of eating by directing my hand to my mouth. Both of the lady and the man nodded enthusiastically as they understood what I wanted. They smiled happily and were ready to serve me. I stopped them and asked the price by saying “how much?” but they did not understand. It was a challenge but I did not give up. I took my wallet, which happened to have Vietnam Dong (VND) in it. I pulled a piece of VND 50,000 note out (yes, that much), waved it to them and asked for one more time “how much?” The man said “aha!” and moved toward an old drawer not far from where he was standing. He pulled the drawer out, which served as a cash box, and took one piece of VND 10,000 and one piece of VND 5,000 notes. He smiled and waved the money to me. I understood that one bowl of noodle soup, which I thought was very similar to Indonesian soto, costs me VND 15,000. The price equals to approximately IDR 7,000. Yes, Vietnam is one of the only few places where Indonesian rupiah rates higher than local currency. As you could imagine, there was very limited communication between the vendors and me. I could not even manage to ask the name of the soup that I ate that night. Let me just call it Vietnamese soto. Nevertheless, the service was excellent. I was provided with a private small table with a small chair. The lady served me enthusiastically and brought a plate of pilled apple in pieces. I was not sure whether or not it was a standard service that they provide for every customer. I felt very special that night. Ho Chi Ming City (HCMC) that night was very friendly. It was very easy to think that I was in Jogja enjoying soto ayam in one of pedagang kaki lima in Malioboro. The only difference, probably, is that a foreigner like me would be charged a lot more expensive in Malioboro. This is just my guess. The lady sat next to me and tried to ask me some questions, even though she knew that I could not understand Vietnamese. 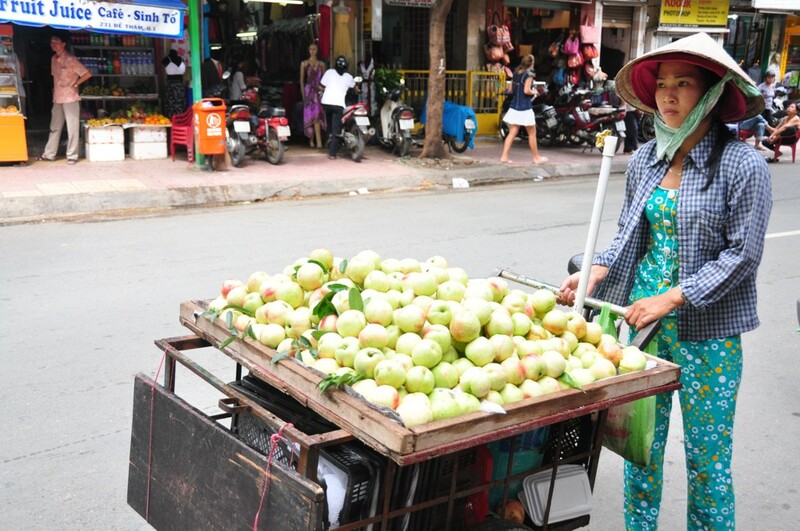 While in the western countries like North America and Europe, that attitude may be considered impolite or even offensive, I viewed it as a sign of warmth and hospitality of Vietnamese and Asian people in general. I could see honesty in her eyes and her curiosity was just endless. I tried my best to respond to her but of course I could not speak Vietnamese. I found that speaking English did not help either. I was asking myself why don’t I speak Bahasa Indonesia? I was thinking and then a few minutes later I found myself talking in Bahasa Indonesia to her. Surprisingly, we went beyond language and we understood each other. Or at least, we thought we understood each other. We laughed and we had fun. The Vietnamese soto was very delicious and fresh. I could really taste the sourness out of fresh citrus lemon or something alike. Having finished the soto, I asked for drink. I made a sign of drinking and asked the lady in Bahasa Indonesia “ada minum nggak?” [what drink do you have?] The man saw me asking for drink and called me to come to him standing close to a cool box. He opened the box and I saw many kinds of soft drinks and tea. No talking involved, I took a bottle of coca cola and then asked for the price. Of course I waved some pieces of VND notes as a universal sign of asking price. He did not answer it verbally but took a piece of VND 5,000 from my hand. What an effective transaction. A few minutes later, I received a text message from an Indonesian colleague that I met during Mekong River Delta tour a few hours earlier. He asked me if I wanted to join him and his friends for coffee somewhere in the city. Of course I cared to join but how could I go there? I was asking myself. I decided to ask the man if he could transport me to the place I wanted to go by showing him the SMS on my mobile phone screen. I asked him in Bahasa Indonesia “Ada ojek nggak?” [any motorcycle taxi? ], while giving a sign of riding a motorbike using my two hands. He said yes and went to get a motorbike that he parked not far from the place. He had two helmets ready, one for him and one for me. I do not really know whether or not he was really a commercial motorcycle taxi driver, I just did not really care. Before deciding to take his service I asked for the price, again, with VND note in my hand. He said something and showed me his two fingers. I guessed he would charge me VND 20,000, not VND 2,000 because it must be too cheap for a ride. I was right and he was very happy when I gave him a piece of VND 20,000 note. Around IDR 10,000 seems fair enough for such a ride. A few minutes later I was traveling along the busy road to the place I wanted to go in the city. The city has a lot of motorbikes, just like Yogyakarta. Street vendors were many and they all were busy. Stalls of food, souvenirs, and cloths filled the foot paths along the street I traveled. In many places, CDs, VCDs and DVDs of music and movies were being sold. I could easily hear the music played loudly, mixing with laughter and chatter of people enjoying the night. It was no different than Indonesia’s pasar senggol or pasar malam. My memory traveled back home to Yogyakarta. 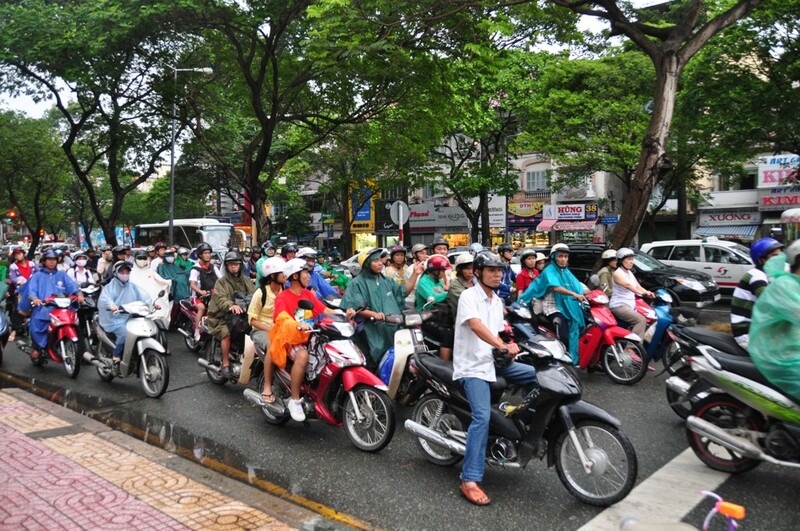 I visited HCMC in August 2010 when I was invited to present a paper in a workshop. It was my first time to Vietnam and I enjoyed it very much. I felt like home already even when I was traveling from HCMC airport to the hotel where the workshop was held. The Motorbikes, street food vendors, a lot of people, busy shops, bicycles, and humid warm tropical weather, all reminded me of Indonesia and Yogyakarta, in particular. 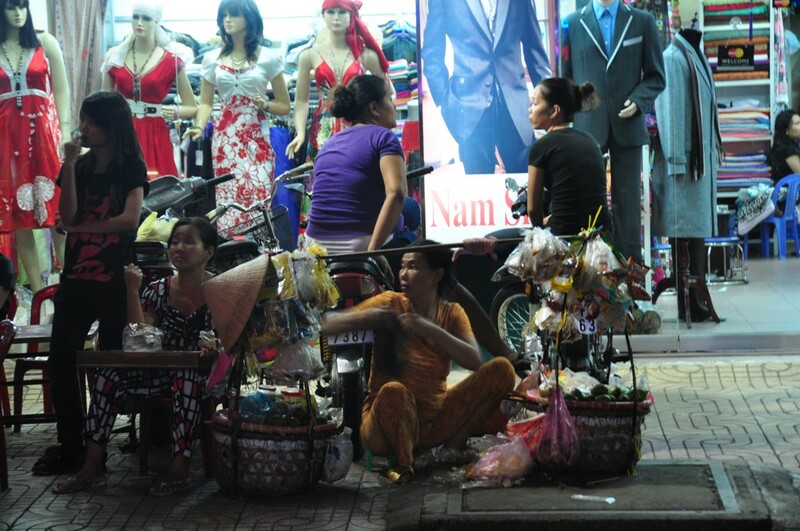 It seems to me that HCMC or Vietnam in general is a very vibrant and dynamic place. I am not an economist but I could tell their economy is growing. It was interesting to see red flags of Communist Party of Vietnam standing side by side with western products logos like Donna Karan New York (DKNY), Louis Vuitton of France, FCUK, etc.